Registration for the CLE Sessions on April 26 and April 27 only. Registration for the Annual Meeting Luncheon on April 27 only. Registration for the CLE Sessions on Friday, April 27 only. 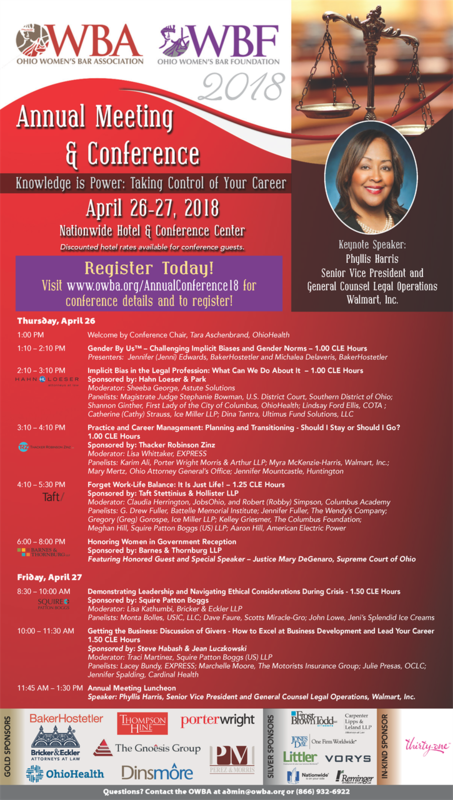 Registration for the CLE Sessions on April 26 and 27, the Honoring Women in Government Reception on April 26 and the Annual Meeting Luncheon on April 27. Registration for the CLE Sessions and Honoring Women in Government Reception on Thursday, April 26. Registration to attend the CLE Sessions on April 26 and April 27 only. Registration to attend the Annual Meeting Luncheon on April 27 only. Registration for the CLE Sessions on Friday, April 27, and the Annual Meeting Luncheon. Registration to attend the CLE sessions on Friday, April 27, only. Registration to attend the CLE sessions on April 26 and the Honoring Women in Government Reception only. Cancellation Policy: All registrations are non-refundable under any circumstances. Registrations can be transferred to another person if the cancellation is made in writing more than 72 hours prior to the event. Cancellations made 72 hours or less prior to the event (Thursday April 26) are not eligible to be refunded or transferred. Cancellations must be sent in writing to admin@owba.org.